Sometimes you just have questions. That’s why we’re here. 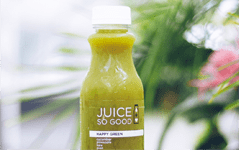 The fresh fruits and vegetables are pressed using a hydraulic press juicer that applies a tremendous amount of pressure to extract the juice directly from the pulp. This process does not produce heat and therefore does not reduce the active enzymes. 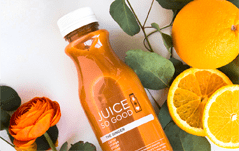 As the juice is never heated, the good stuff like beta-carotene, ascorbic acid, and other vitamins are still naturally present and available for your body. Our body needs these active enzymes to aid in digestion and absorb other nutrients. These are not found in cooked or processed foods, only raw fruits and vegetables. The main reason is that it is fresh and perishable. Most juice is treated with heat pasteurization (HSTS). HSTS heats the juice to 90-90ºC for 25-30 seconds. This destroys the nutrients and changes the flavor and color. This is why juices treated with HSTS have ‘natural and artificial flavors’ added to them to make them taste ‘fresh’. As an added bonus, juices treated with HSTS can be shelf stable, without refrigeration, for up to 8 months. Our juice is never heat-treated and always needs to be kept under 40ºF. Another reason is the amount of produce squeezed into every bottle: several pounds per bottle. It’s a lot of produce. We use only high quality non-GMO ingredients, and take great care to ensure that if we would not use it in our kitchen at home for ourselves and our families, it does not go into our juice. The final reason cold-pressed juice is so pricey is the pressure needed to make the juice and the process needed to make it safe. Making cold-pressed juice requires thousands of pounds of pressure to squeeze juice out of the produce (which requires expensive equipment!). Finally, preserving the nutritional value through a method called high pressure processing (or HPP) is also an expensive but important process as it kills bacteria without killing nutrients. It keeps you safe and means that our juices are safe to consume for the young, the elderly, during a pregnancy and for anyone with a weakened immune system. We love raw juice, but everything that is good in the juice for you is also good for bacteria and can make you very sick. High Pressure Processing (HPP) is a cold processing technique by which our bottles, already sealed in their final package, are introduced into a vessel and subjected to a high level of isostatic pressure transmitted by water. In short, the bottle of juice goes into a chamber, the chamber is filled with ice cold water, the water keeps coming in to increase pressure. The pressure kills the bacteria and makes our juice safe to drink, but as the water is ice cold the juice is prevented from heating up and cooking the active enzymes. HPP kills the bad while preserving the good. If you have ever snorkeled its the same pressure that you feel when you dive under water. Nothing more. WHY DOES THIS JUICE LOOK DIFFERENT FROM WHEN I PURCHASED IT? WHY ARE THE SAME JUICES DIFFERENT COLORS? Our juices are handcrafted with love in small batches. Each plant is unique and brings it’s own color and flavor to that batch. The only way to guarantee uniformity with any food is if it is made in a lab. We juice in a kitchen. In addition, the juice will settle or separate in the bottle. Juice So Good does not add anything to the juice to prevent this. If there are white specks, this is just the ginger. Simply shake prior to opening, and enjoy! WILL I LOSE WEIGHT ON MY CLEANSE? Maybe. If you do, some of this is water bloat, but also some is fat. A juice cleanse is a great way to jump-start a healthy eating initiative. It not only helps control appetite and cravings, but is naturally lower in calories, while supplying the body with more concentrated beneficial energizing and healing nutrients than it had before. We believe it is better to focus on health and wellness while on a cleanse, as opposed to the number on the scale. A cleanse is 6 juices per day for 1 or more days. This provides 1200+ calories a day, and while that is sufficient for some, based on your activity level or caloric needs you may need to consume other healthy food options. Anyone who is diabetic or with any other medical condition should consult their physician prior to starting a juice cleanse. Cleanses are not suitable for children but they certainly can enjoy drinking our juices as part of their healthy diet. SHOULD I DO ANYTHING DIFFERENTLY BEFORE STARTING MY CLEANSE? In the 3-5 days leading up to your cleanse, decrease the amount of highly processed foods and cut back on meat, dairy, alcohol, and caffeine. SHOULD I DRINK WATER WHILE ON MY CLEANSE? Yes! Try to drink 16 ounces of water between each juice. If you are normally an active person, working out while cleansing shouldn’t be a problem. Be sure to listen to your body and take it easy if necessary. CAN I EAT WHILE ON MY CLEANSE? Eating healthy whole food options does not negate either of these benefits. If you feel light-headed or just can’t make it through the day without eating something, that is okay! If you do need to eat make sure to stick to raw vegetables and fruit. Some people require a higher daily caloric intake so be sure to listen to your body. 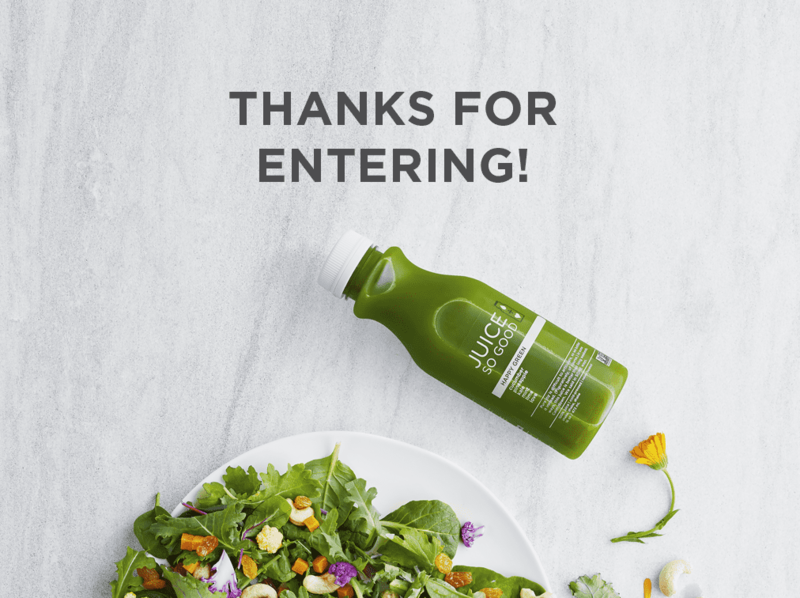 You can always reach out to support@JuiceSoGood.com with any questions. We are here to help ensure your cleanse experience is wonderful! WILL I EXPERIENCE SIDE EFFECTS WHILE CLEANSING? Possibly. Some potential detoxification symptoms are: headache (sometimes as a result of caffeine, sugar, salt, or other preservative withdrawal), nausea, diarrhea, or irregular bowel movements. 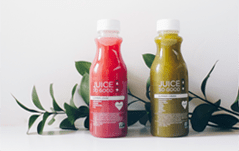 It’s because of these potential detox symptoms that we offer full support with our cleanses – email us at support@JuiceSoGood.com at any time with your questions. When you sign up for a subscription, your credit card will be charged the subscription amount selected above every month until you cancel or modify your subscription. To cancel or modify your subscription, please visit “MY ACCOUNT” and visit “MY SUBSCRIPTIONS” to end your subscription, or call 844-665-5683. CAN I ADJUST MY SUBSCRIPTION PLAN LATER ON? Absolutely! Contact us at 1-844-665-5683 and we can put together a subscription that best fits your needs. After purchasing your subscription, go into “my account” and click “order baby food.” From there you may select your delivery date and your favorite products. If you choose to cancel your subscription, you may do so after the third month. Go to “my account”. All cancellations will be applied to the next billing cycle and will not be issued to the current cycle. You can continue to enjoy the same benefits for the remainder of the current billing period. Billing cycles vary and are based on your initial subscription purchase date. WHAT IS HIGH PRESSURE PROCESS (HPP)? We love raw foods, but everything that is good for you is also good for bacteria and can make you or your baby very sick. High Pressure Processing (HPP) is a cold processing technique by which our pouches are introduced into a vessel and subjected to a high level of isostatic pressure transmitted by water. The pouch goes into a chamber and the chamber is pumped full of ice-cold water to increase pressure. This pressure kills bacteria and makes our products safe for you and your little nugget. Since the water is ice cold, the baby food retains its nutrients and active (good) enzymes. HPP kills the bad while preserving the good. As our baby food is never heated, the good stuff like beta-carotene, antioxidants like Vitamin C, and other nutrients are still naturally present and available for your growing little one. Our bodies need these active enzymes to aid in digestion and absorb other nutrients. These are not found in cooked or processed foods, only raw fruits and vegetables. WHY DOES IT COST MORE THAN OTHER BABY FOODS? The main reason is that it is fresh and perishable. Most baby foods are treated with heat pasteurization (HSTS). HSTS heats the product to 90-140ºC for 25-30 seconds. This destroys most of the nutrients and changes the flavor and color. Baby foods treated with HSTS can be shelf stable, without refrigeration, for months and even years. Our baby food is never heat-treated and always needs to be kept cool, under 40ºF. We use only the highest quality organic and non-GMO ingredients, and take great care to ensure that if we would not use it in our kitchen at home for ourselves and our families, it does not go into our baby foods. In fact, our standards go far beyond the standard organic certification and non-gmo verification, because we use a third party to test for the presence of 45 different contaminants in our produce to make sure that So Good Baby food is the cleanest, safest food for your baby. The final reason is the pressure needed to make the baby food safe to eat. Preserving the nutritional value through high pressure processing (or HPP) is an expensive but important part of the production process as it kills bacteria without destroying nutrients. It keeps you safe and means that our baby foods are safe to consume for your precious baby! Absolutely! We currently ship to the lower 48 states. We pack our pouches with love in recycled cardboard boxes with environmentally-friendly insulation and recyclable frozen gel packs to keep your products chilled during shipping. The entire shipping solution is 100% recyclable and biodegradable, to uphold or commitment to Zero Waste. HOW SHOULD I STORE MY SO GOOD BABY FOOD? Keep your pouches chilled to maintain freshness until the “Enjoy By” date stamped on the back. 33 to 41 degrees Fahrenheit is cool! A good rule of thumb is to think of your So Good Baby products like dairy and yogurt and apply similar logic to their handling. HOW ARE SO GOOD BABY FOODS DIFFERENT THAN OTHER BABY FOODS? Our baby food is made with only pure, organic, non-GMO fruits and veggies, and carefully crafted with unconditional love. Nothing added. Ever. Since we believe it’s important for mom to feel good about what she gives her baby, we placed a big window on the pouch. And because we don’t believe organic certification and non-GMO verification is enough and never compromise on food safety, we go the extra mile by having a third party lab test our ingredients, before we use them. DOES SO GOOD BABY CONTAIN GLUTEN, SOY OR DAIRY? ARE SO GOOD BABY FOODS NON-GMO CERTIFIED? Absolutely. Not only are we Organic Certified and Non-GMO verified, we make So Good Baby in our own certified organic facility. This allows us to follow best-in-class sourcing and manufacturing practices that result in a product that is beyond organic when it comes to safety and quality. WHERE CAN YOU BUY SO GOOD BABY FOODS? You can buy our baby foods online here, or at one of our grocery and partner locations here. As part of our Do So Good brand DNA, taking care of the environment is a major priority. Whenever the option is available, we choose materials that are better for Mama Earth. Currently, our So Good Baby cap is fully recyclable, and all products ship in a 100% Zero Waste shipping solution. While pouches currently on the market are not able to be recycled, we are working closely with our manufacturer to change this. However, you should still feel good about your purchase as pouches produce a significantly smaller environmental footprint than traditional jar baby foods, both glass and plastic. Their lighter weight and size allows for more efficient packing and transportation, as well as more efficient disposal. Know that this is important to us, too. Stay tuned for updates on our pouch recycling initiative coming so soon! HOW SHOULD I PACK THE POUCHES WHEN I'M ON THE GO? A good rule of thumb: treat your So Good pouches similarly as you would other perishable product you feed your baby, like breast milk or yogurt. It is a good idea to keep it in an insulated pouch with an ice pack if you’ll be running around and want to make sure you have something yummy and nutritious to give your kiddo.